Carmel Portrait Smooth is a silky-smooth 100% cotton canvas that is ideally prepared for fine detail work. Sized and double-primed, the canvas is put through a smoothing process that allows your brush to effortlessly glide over the surface. The unique ground has enough tooth to allow the paint to grip the surface. 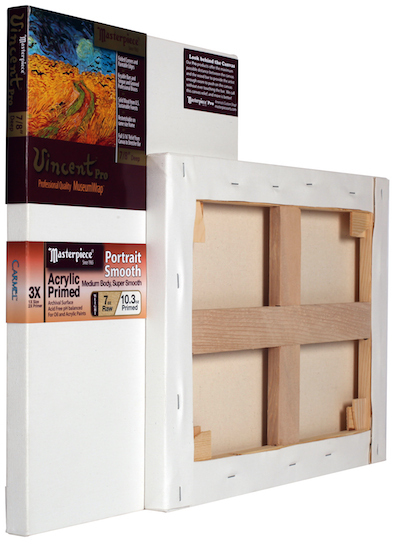 Monet Pro stretched canvases feature a 1½" profile with a ½" lip that keeps the canvas surface positioned high above the bars to prevent lines and indentations. The key-able cross bracing on canvas sizes 20" × 20" and up offers additional strength, stability and warp-resistance.